Think You've Seen It All? This Atlas Might Change Your Mind : 13.7: Cosmos And Culture Unless you have seen a garden of poisonous plants, a shrine to insects, or the bones of 1,000 ancient whales, you have more traveling to do, says anthropologist Barbara J. King. 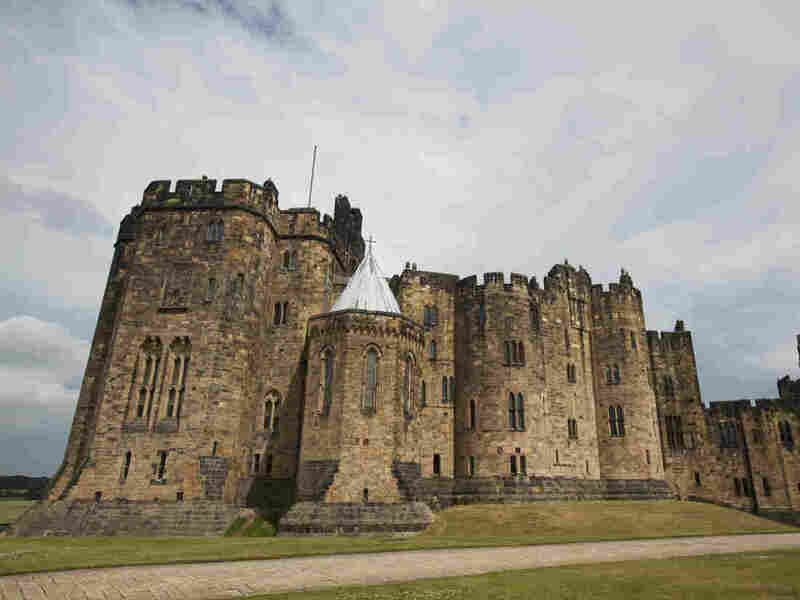 Alnwick Castle in England houses a garden of poisonous plants. In England's Northumberland area, at the Alnwick Castle, you can tour a locked patch of ground where killers reside. This is the section of Alnwick Gardens dedicated to poisonous or narcotic plants. Once you find a garden keeper to let you through the locked gates, plants — some so toxic they are caged — come into view. They range from strychnine to poppies and hallucinogenic mushrooms. Across the ocean, at Japan's Kan'ei-ji Temple in Tokyo, is a Buddhist shrine called Mushizuka ("Mound to Insects"). It's meant to console the souls of insects that were killed in service to an artist's accurate rendering of illustrations for a science book. Why do these attractions, well, attract me? Each turns a usual assumption on its head, that flower gardens are meant for us to gaze upon charming beauty, and that insects are disposable without a second thought. These two entries help explain why I am hooked on Atlas Obscura, the about-to-be-published book by Joshua Foer, Dylan Thuras and Ella Morton that catalogs more than 600 "curious, out-of-the-way places" dotted across the planet. The human brain seems to love lists and, at its core, Atlas Obscura is a text-rich, prettily illustrated, brick of a list. It invites us to compose fantasy travel lists of our own, or seek places we've already traveled to that have made the cut. This volume is a hive-mind type of publication. In a short introduction, Foer and Thuras thank the "incredible community of users, explorers, and contributors" who helped shape the book with suggestions and photos. The whole project grew out of the Atlas Obscura website, where new entries will continue to accumulate. In Atlas Obscura the book, there's something for everyone. Are you a thrill-seeker? For you, there's the North Ungas Death Road near La Paz, Bolivia, a 12-foot-across, 43-mile-long highway that winds its totally unprotected way (no guard rails!) between a wall of rock and a terrifying 2,000-foot abyss. Are museums your thing? The Museum of Broken Relationships in Zagreb, Croatia, might be for you. The atlas tells the tale: When two artists broke up in 2003, they turned their private joke — that they'd need a museum to display their shared objects — into reality. From axes to airsick bags, teddy bears to bottled tears, material culture is diverse in the museum. You are welcome to contribute to it, should you be in recovery from a recent broken partnership. One entry that turned my stomach but might mean something different to a food adventurer: Tongzi dan, or eggs hard-boiled in the urine of young boys, a "traditional delicacy" available in Dongyang, China. My favorite places touted in the atlas, like the insect shrine and poisonous garden, are all related in some way to the natural world. In the Wadi Al-Hitan area of Egypt's Western Desert, bones stud the sand. Bones of 1,000 ancient whales known as Archaeoceti have been identified in The Valley of the Whales. These were footed whales that lived there underwater around 40 million years ago. Coolest of all, "hundreds of partial skeletons remain in the sand, on display to any visitor who is willing to make the long trek through the desert." According to the atlas, the world's heaviest known organism weighing in at 13 million pounds is a "clonal colony" represented by a single tree right here in the United States, at a place called Richfield in Utah. What appears to be many thousands of separate trees in a forest of quaking aspens are actually genetically identical, "and the whole forest is linked by a single root system" estimated to be 80,000 years old. And always intrigued by nontraditional methods of burial like this organic pod I wrote about earlier this year, I'm fascinated by the chance to sign up for underwater burial in the Neptune Memorial Reef in Key Biscayne, Fla. Made to mimic the supposed lost city of Atlantis, this "living artificial reef" invites us to come to final rest in the watery elements. When people choose this final resting place, their remains will be "mixed with cement and sand, poured into a shell- or starfish-shaped mold, and added to the reef," the book says. Mourning family members and friends may participate by scuba diving or observing from a boat. The Atlas covers Europe, Asia, Africa, Oceania, Canada, the U.S., Latin America and Antarctica.